1. New MySQL Full-Text Search Features and Solutions, where I will focus on the new (and very promising!) InnoDB full text search. I’ve done some benchmarks recently and will publish it here. 2. 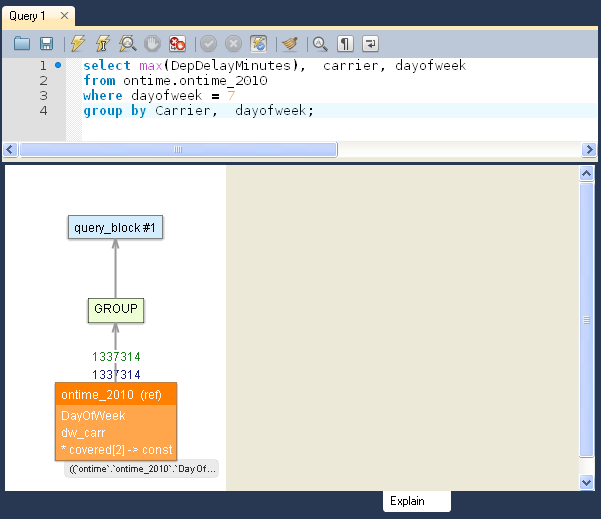 In-Depth Query Optimization for MySQL, where we will work on the real word examples of MySQL query tuning. In my previous post, I’ve showed how to use Dtrace to find queries creating disk temporary tables (only available for OS with dtrace: solaris, freebsd, etc). In MySQL 5.6 (which is not released yet, use “labs” version for now) we can use new performance_schema table events_statements_history or events_statements_history_long to find all performance metrics for all queries including created disk/memory tables, use of index, etc. WOW! This is what I have been waiting for a long time! To illustrate, I have grabbed mysql-5.6.3-labs-performance-schema-linux2.6-x86_64.tar.gz from labs.mysql.com (this feature is only in labs version) and run sysbench readonly test (you need to disable prepared statements in sysbench, seems to be not working with prepared statements, I will check it later). We can filter and order by rows_examined, SORT_MERGE_PASSES, NO_INDEX_USED, NO_GOOD_INDEX_USED, etc. With the standard data warehousing queries we have a fact table and dimension tables and we join them. (this is not the best possible fact table as the data is not aggregated by I’ll use it for now). As MySQL will use indexes when we have "field = (select .. )" and now all fields in the index belong to the single table, MySQL will use index and avoid filesort. Please note: this will not work with "field in (select ...)" and also make sure that the subselect part will return only 1 row. In this query we show all messages from and to user_id = 247 plus all messages to system user (user_id=0). We need to show only messages for the last 3 months and show the most recent messages first. However, as the query uses “OR”, MySQL will use a filesort. UPDATE: even if we will create combined indexes on (recipientaddress_id,mail_timestamp) and/or (senderaddress_id,mail_timestamp) those indexes will not be used, as the query contains “OR” in the where clause. Although this query has to perform a final filesort it is much faster: now it runs in 0 sec compared to 3 seconds originally. Continue reading Why mysqldump is converting my tables from InnoDB to MyISAM?